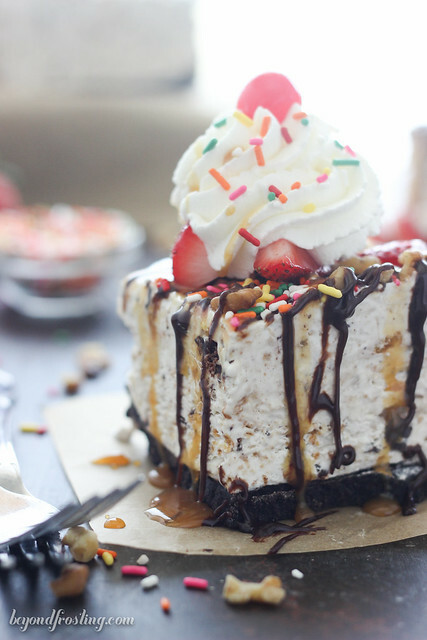 This Banana Split S’mores Ice Cream Cake is everything you’ve ever dreamed of in an ice cream cake. The airy no-churn s’mores ice cream is filled with marshmallow, chocolate and graham crackers plus smashed banana. 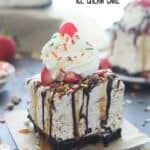 Top this ice cream cake with your favorite banana split toppings and don’t forget the sprinkles! Something awesome happened this weekend. My boyfriend came up to me and told me that he needed to tell me something. He was driving the other day, and some debris flew up in front of the car, some round, brown cardboard stuff. He thought to himself, hmm, that looks like a cake round. So when he was telling me this story, he told me how ridiculous it was that the thought even popped into his head. We had a good laugh and I reminded him that was just the beginning. Another amazing thing happened this weekend. 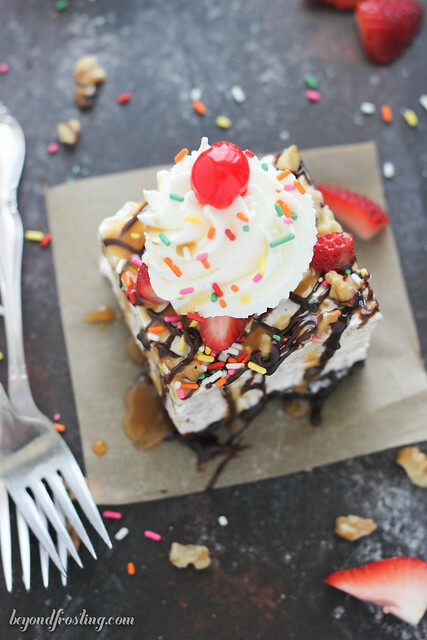 This Banana Split S’mores Ice Cream Cake which is pretty much the best thing to happen to ice cream cakes since umm, the last one I said was my favorite. Sorry, I’ve got a lot of favorites. This one is different though, the smashed bananas in the ice cream adds another level of flavor that is undeniable! Plus it’s summer so s’mores are in full effect. The ice cream is made with marshmallow cream, graham cracker and chocolate chunks. So many good things all in one place! 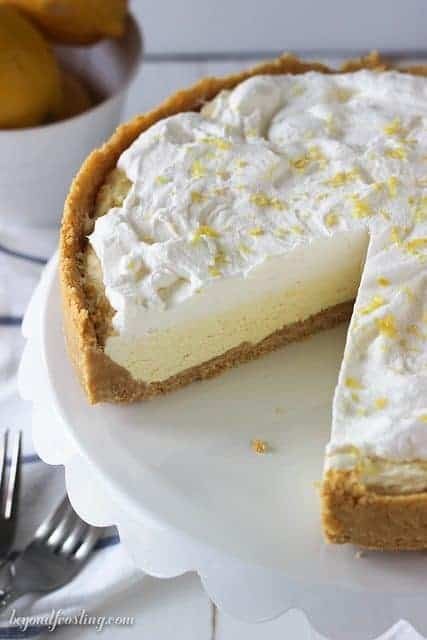 I love adding marshmallow cream to my dessert because it is a bit sweet, but adds some air into the filling creating the lighter texture. When I was in high school, I worked at a sweets shop that sold candy, fudge, cakes, baked goods and ice cream. I worked there for several years, and during the summer the line was out the door everyday. When someone came to the counter and ordered a banana split, it was kinda stressful. It takes a bit of time to craft the perfect banana split. 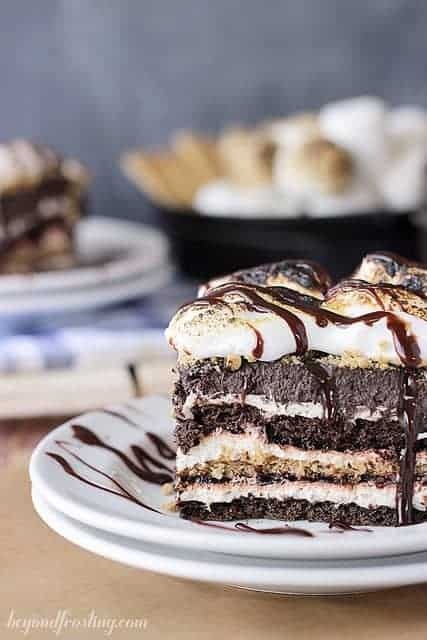 One reason this Banana S’mores Split Ice Cream Cake is awesome is because you can customize it any way you like! I started with an Oreo cookie crust (I wanted more chocolate), but a graham cracker crust would be just fine too. 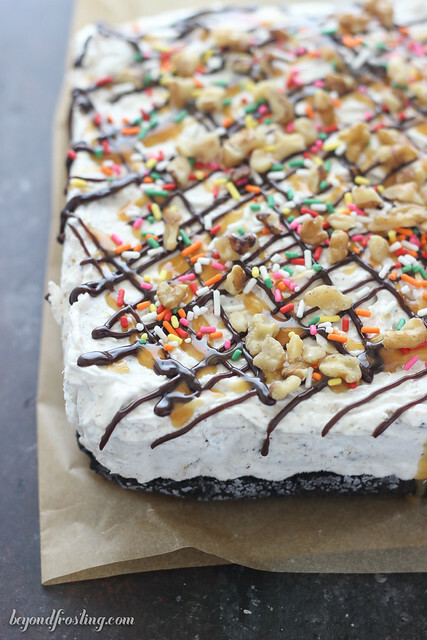 After you cut off a slice of this ice cream cake, you can top it with whatever you want! I used strawberries, hot fudge and caramel sauce, sprinkles, nuts and whipped cream. Naturally, I topped it with a cherry, but I will tell you, the cherries are not my favorite part, but they sure are pretty. I also have a confession. Over the weekend I started another one week cleanse, where I eat nothing but fruits, vegetables, chicken and nuts. It was REALLY hard for me to avoid trying bites of all the things I made this weekend. So I cheated. 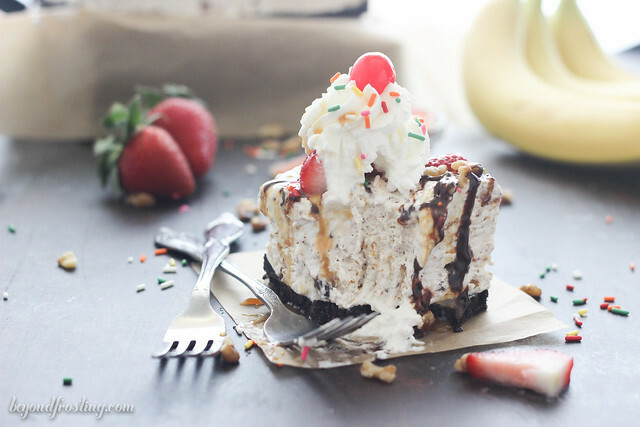 I just could not stop eating this Banana Split S’mores Ice Cream Cake. 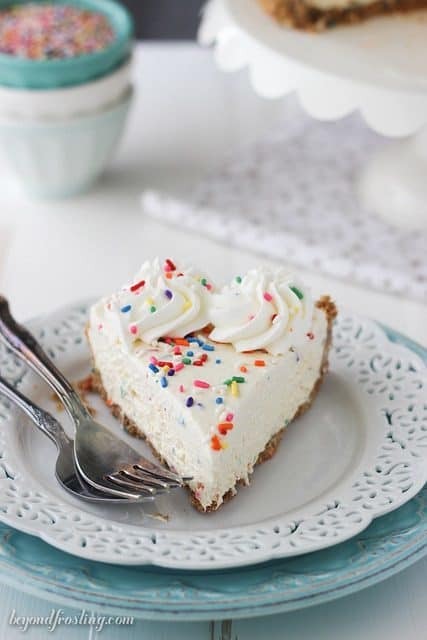 I am for sure saving a slice of this for when my cleanse is over next weekend. I made mine in an 8-inch by 8-inch pan that was about 3-inches deep. This recipe makes a lot of filling, and the filling came right up to the top of the pan. You could easily make this in a 9-inch square pan as well. It is best to allow your ice cream cake to thaw for 15-20 minutes before cutting. The ice cream gets a bit softer and it is easier to cut through. Don’t be afraid to go crazy with your favorite toppings. For the crust, grind Oreos into a fine crumb using a food processor or blender. Put crumbs in a microwave-safe bowl. Add butter and microwave for 45-60 seconds until butter is melted. Stir to coat Oreos in butter. Line the bottom of an 8-inch square pan with tin foil. Press crust into the bottom of the pan. Refrigerate until the filling is ready. Add two peeled bananas and beat until well incorporated into the cream cheese. Spoon the marshmallow cream into the bowl and add sugar. Mix on medium speed until all ingredients are well combined. Scrape down the sides of the bowl. Lastly, add graham cracker crumbs, chopped chocolate and Cool Whip. Continue to mix, once all ingredients are well mixed, pour into prepared crust. Freeze for 4-6 hours. To serve, remove from the freezer, lift it out of the pan with the tin foil. Allow to rest for 20 minutes before slicing. 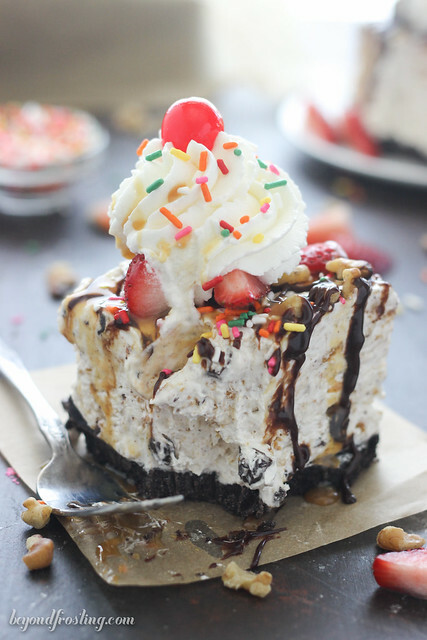 Add your favorite toppings: strawberries, hot fudge sauce, caramel sauce, sprinkles, nuts and whipped cream. I used an 8″x8″x3″ pan and the filling came right to the top. Feel free to use a 9″ square pan as well. This cake has summer written all over it! Anything Ice cream and I am there! This looks beyond mouthwatering girl! 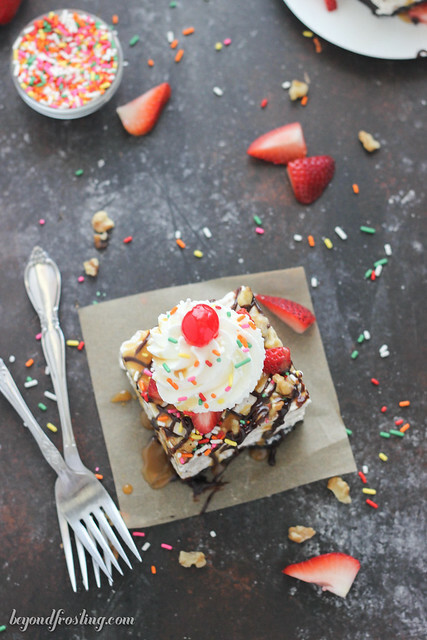 I can’t get enough of ice cream lately and this banana split s’mores version has to be the most creative! Totally brilliant and pinning! OMG, are you kidding me???!!! I want this as my birthday cake! 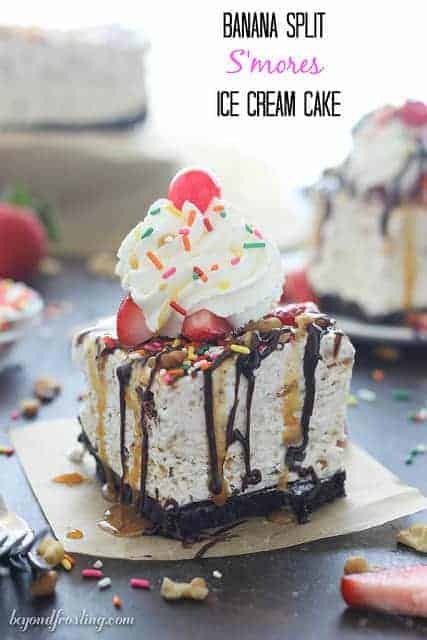 I can’t get enough of no bake desserts but this one seems to have it all! Chocolate, ice cream, marshmallow, bananas – I’m in heaven. And that height! I love it! there is NO way I would have been able to make it through a cleanse with this cake anywhere near my house! Ohhhhh dear I would have so cheated to inhale this delicious treat!! !